Here’s a color scheme that works. Black and charcoal for the carapace and red for the skin. It gives them quite a hellish appearance. After playing four games (yeah, I know a lot), my impression of the Tyranid book is that it depends on synergy. The units are interdependent and must be used as such to have their greatest effect. In other words, to survive. Imperial Guard firepower is nothing to cough at. As I found out in my game against R&C, even lowly guardsmen, if they are in cover, are really hard to uproot, and if you’re caught with a Vendetta (heaven forbid two) at long range picking away at the large creatures, it’s going to be a turkey shoot. But the Hive Mind learned something from that. Cover is good. Scores of Hormagaunts, swarming across the field is a pressing threat. They can take down all but die hard elites. But their real service is bullet eaters. But how to keep them alive? That’s where the Venomthropes come in. Tervigons can give Catalyst. Unfortunately, there’s nothing to keep her alive. So, I’m looking at mid-sized creatures because they can claim cover saves from the smaller gribblies. And it’s got to be fast. It’s got to be a second-turn charge. 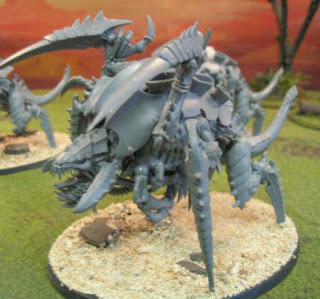 I’m looking at good ole Tyranid Warriors and Tyranid Primes. Will that do it? 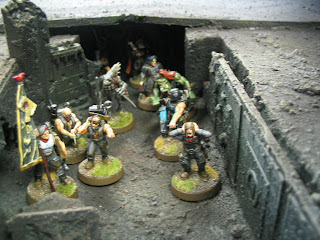 Or Raveners for shock troops. That’s a second turn charge as well. I am really like Mycetic Spores. They are monstrous creatures so they block line of sight, a meat shield for the advancing other creatures. And most things in the list can have them. What happens when the whole army shows up on Turn 03? As I have it, Tyranid Primes can ride with their crew in one. Is that right? It also occurred to me that as more of them show up in the same area, their chance of scattering is reduced as they crowd a particular section, creating a wall of spore pod meat. A Deathleaper helps here. And various trouble-shooters: Harpies, Tyrannofexes about 700 pts worth. The trouble here is that whatever starts on the board will be subject to attention while the rest shows up. I’m liking Tyrannofexes because they can take a beating against long-range stuff (and maybe not even that if placed correctly) and still nail the big guys with 48″ range Assault Rupture cannons at S10. Not sure I like that many points in one sink since the theme here is a disruptive force where nothing is on the board until it starts raining crap from the sky. What about Trygon Prime? That fits. No need to hang out for turn 1 and/or 2. But the Trygon in my last games has just got blown up every time. But then again the board will be dotted with mycetic pods. How many? Oh, just five. Cost for a Tervigon (any type) is $95 (two for $180). That includes the cost of model and assembly (but not painting, that’s $90, two for $170). Price may vary check with me at bluetablepainting@gmail.com if this post is more than 2 months old. 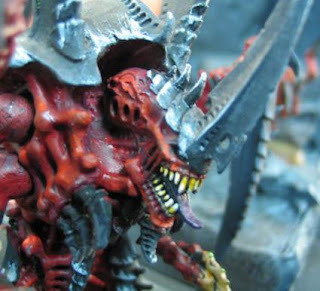 Note: we are nowadays doing Assembly-only projects and we can do Tyranid special creatures for you. I have noticed something. It’s pervasive. A conservative President is called a hypocrite because he praises firemen and police while at the same time wishing to reduce the size of the federal government and the power of the unions. Glenn Beck (conservative) was criticized by Rachel Maddow (liberal) for decrying federal programs (eg healthcare as a socialized service) while at the same time adulating his local public library (a social service). Oooh, how can he do that? Michael Moore did the same thing in one of his books (can’t recall the name at the time), arguing “Well, you have the fire department which is a socialized system, then why don’t you want socialized healthcare?” It’s because the former is done at the city level and the latter at the federal level. One is easily managed and tailored to the needs of the populace, and the other is a distant power that cannot manage local peculiarities. taxes? Usually, the more useful services, that are of most benefit, come from the more local regions (eg schools, police, firemen). The city fills the pot-holes. The county keeps a jail and a court-house. I love local government. They require the least and give the most. It is also easier to overthrow a local corruption than a distant and centralized one. The same power that acts benevolently can quickly be turned into a War Machine. De-centralization is good. It puts the power closer to the people. Even a State government can be purged if it grows too onerous. I suggest to you kindly reader, that you think carefully on where public services come from and how they are funded. As far as I can tell it goes something like this. The city wants a quarter. The state wants two dollars. The feds want ten dollars. Why do they need so much? It should be the other way around, and about half that amount. A Congressman that tries to get money back from the Federal Government for his district AND who speaks out against wasteful “pork barrel” spending is acting without hypocrisy. He wishes the money did not get sent to Washington to begin with. But while it is, he will try and get back as much as possible. We send a pie, which is pecked over by the vultures, then get back a single slice with bird tracks all over it. It has to end. Then again, I am biased because I live in a voluntaristic society of do-it-yourselfers (Mormons) who have a whole society running smoothly with just 600 people involved (a Ward– you can be in one too!). Most problems can be solved at that level. Based on a rough estimate of now over 3,300 project completed, Blue Table Painting has now completed over two tons of figures. higher in the tournaments now that everything is painted. quality as ever. Thank you for turning them around so quick (2 weeks)! 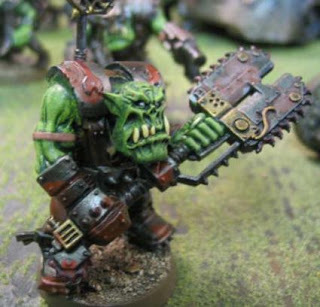 know what a Space Ork are think they are the coolest looking models ever. This (a bit from a GW FAQ recently released) is insane. That makes the Deff Rolla an absolute must. It can grind a Land Raider into dust! If you have a project with BTP, and you have a deadline or a time limit, I strongly urge you to email me with the specific date. Same thing if it has been four weeks or more since you sent your deposit. It is likely that everything is on track. However, I would like to generally make sure everything is on track and this will help. Today it all came together. I am composing a vid of it. There were three games going on all at once in the main room. It was great. Productivity is in the toilet. But the games had to be played. First off, I got Julie and Tasha behind the wheel of the studio Imperial Fists army (didn’t know about that one did you?) and they took me to the cleaners. Of course, I was playing against myself since I was heavily advising them. I am truly a … Formidable Opponent. I took my two sons out this morning to get a few of their favorite type of toys just for kicks, then for pancakes at a local restaurant. It was a moment of magic with lots of leftovers. Unfortunately, I forgot the boxes on the top of the van and drove off, so there are blueberry pancakes all over the street somewhere. I also headed to Toys R Us for raw materials for the starport. I got a bunch of stuff for that. The plan is to have the equipment that might be needed at a starport, like unloading equipment, fueling tanks, generators, defense towers and so forth. We’ll see how it turns out. But all that has to go on hold, even unfortunately the terrain-making. I am dedicating the next two days to catching up on work and emails. About the studio Imperial Fists army. This is a decent-looking force I picked up on eBay, refurbished, and added some units to round it up to 2000+ pts. In the Tyranid book there are three types of creatures: small, medium and large. The monstrous creatures cannot get cover saves from the others generally, so they are in a class apart. The medium creatures can get cover saves from the smaller gribblies. The Parasite is jump infantry, not necessarily even on a 40mm base. I’m thinking more of a jump-packer-sized thing. These two things have to match up. The Parasite can run with Hormagaunts and keep up with them, which is a nice feature. I’m going to try this once and let you know how it goes. Actually, you will probably see it in a video batrep. I am currently a huge fan of Hormagaunts. They are the same cost as Gargoyles. I’m not trying to say one is better than the other. I just think they serve the role of shock troops better. On the net, their total movement is only about 1-2″ less. They can move through terrain better, getting cover saves. The big drawback of Gargoyles is that they have to take difficult terrain tests, or be out in the open. After all, who is going to screen them. I see Gargoyles as being more of a troubleshooter unit. I plan on trying out a unit of 10 and seeing if they can cause some damage. That’s only 60 points after all. They can do something that Hormagaunts cannot: get up to higher levels of terrain easily. I see them more as a unit to lurk around the edges and pounce on pesky units. An interesting list to try out would be all Mycetic Spores. I wonder how a conga line of those things would affect the battlefield. If you’ve seen the models I’m using for these, we can create a painted one for you for $110 (or two for $180) or you can just get the model for $50 (four for $180). 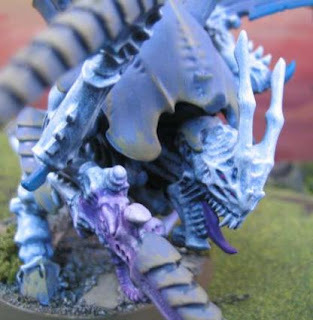 The trick with Tyranids has to be the synergy of units. How do two units work together. Example: Parasite of Mortrex can run with Hormagaunts, giving it protection while the gaunts get some extra hitting power. But the Parasite is pretty spendy for it’s relatively tame hitting power, that is a problem. I mean, it costs as much as a Carnifex for pity’s sake. Speaking of Carnifexes, I’m just not seeing it. I do plan on running a pod to see how they do. I would really like to (just once) run nine of those boys across the table. Strength 9 is their big item. And bio-plasma, don’t forget they can turn into a close range plasma cannon. Back to synergy. Small and medium creatures are the two great tastes that taste great together. The gribblies give cover saves while the large creatures add hitting power. I see Shrikes working well here as they can hop about out of sight (the best defense against shooting is to simply be unseen completely). They have the enormous downside (Gargoyles too) of dangerous terrain tests. There is a ton of difficult terrain on the typical 40K board. But I don’t see that as a big downside. Starting to love the Shrikes. Want to try them out. I’m thinking a brood of five. Or maybe just three to keep their profile slim while still keeping spread out. Three medium creatures on 40mm bases, spaced 2″ apart can only have one member of the brood hit by a large blast template at a time. That ain’t bad. I’m really worried about the trenchworks board. That thing is a deathtrap for Tyranids: gribblies forced into a tight pack down in the trenches means the cover save is not so useful. A pair of flamers and it’s roasty time. The thing I love about the Tyranid codex is that it is full of mono-purpose creatures which means that they can handle almost any situation. If the swarm is large enough. If you are interested in a board like this of your own (it’s exquisite), please inquire at bluetablepainting@gmail.com Cost is likely in the $1500-2000 range depending on various factors. Plus actual shipping costs.